We are happy to announce our spring school of “Language and Music in Cognition” taking place in Cologne, Germany, from February 2nd to 8th, 2019. If you wish to participate in this spring school, please apply until November 30th, 2018. Important details are also summarized below. 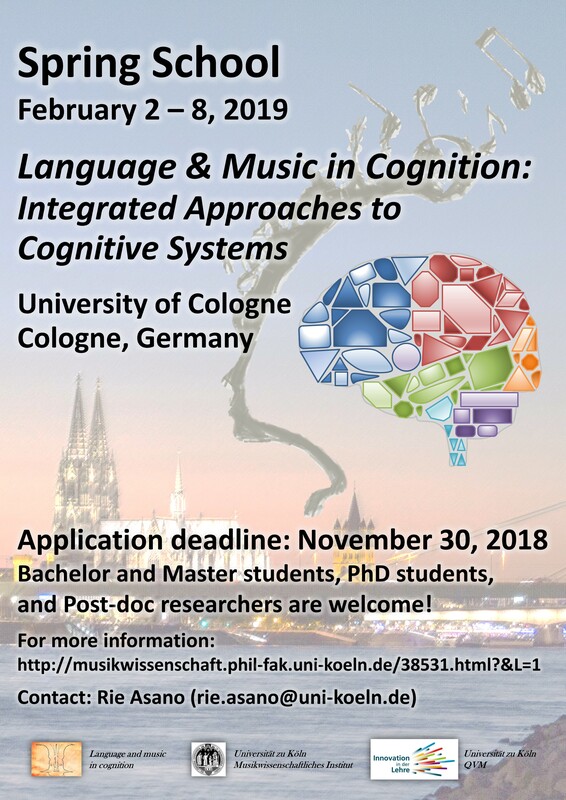 “Language and Music in Cognition” is an international spring school held from February 2nd to 8th, 2019 at University of Cologne, Cologne, Germany. The spring school is open for Bachelor and Master students, PhD students, and Post-doc researchers. Participation in the spring school is free of charge. If you are interested in participating in this spring school, please submit your application (motivation letter and CV) until November 30th, 2018. In addition to the lectures, there will be workshops, group work sessions, discussion sessions, and a poster session. Applicants are invited to contribute their own work to the poster session. An abstract of the poster can be also submitted via the application form until November 30th, 2018. Click here to review all news about MusiCoLinguistics! Many of the pictures and ton materials on this homepage are made by Florian Römer. Thank you very much for the high-quality materials!